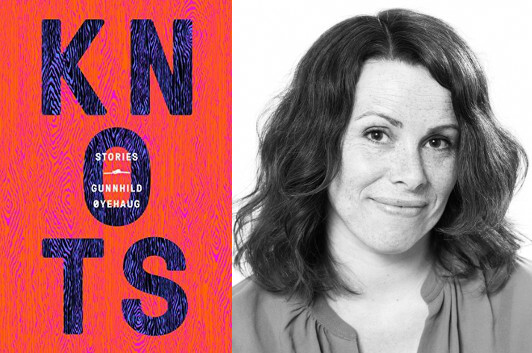 Knots is full of short stories—some of them no more than a single paragraph—that burrow deep into a character’s head as they muddle through situations that threaten to overwhelm them. A man decides he’s going to prove to his wife he’s not a complete loser and tries to go shopping at IKEA; a young girl wants to get from her bedroom to the bathroom without her family noticing her and forcing her to play the piano; a deer stands at the edge of the forest, depressed because nobody notices him. Gunnhild Øyehaug is less interested in the mechanics of plot than the complexities of consciousness—and not just the character’s consciousness, but the narrator’s and, perhaps, by extension, the reader’s. In this guest essay, the Norwegian author talks about some of the writers who set her on that path. Sometimes you read something that changes the way you write. My short stories exist, as texts, somewhere between what you call stories and short prose. Dubliners by James Joyce changed my short stories, and after that they were changed by Kafka’s stories, and after that it was Daniil Kharms’ short prose (or prose poetry), combined with a strong love for anything written by Virginia Woolf. I’d been writing short stories since I was a teenager, heavily influenced by the Norwegian short story master Tarjei Vesaas, and perhaps also the Norwegian short story master Johan Borgen, and the Norwegian pulp fiction queen Margit Sandemo. I suppose I took the drama from the pulp fiction and combined it with Vesaas’ heavy symbolism and Borgen’s dynamic, entertaining narration in a way that many times has made me think that I’m glad my short stories from my teenage-writer’s period have never been found again. Still, I think there might be traces from that heavy combination in my writing, but when I read Joyce, at the age of 22, it was a revelation. I loved the way he turns the stories around just before the ending, how they are all centered round and built up to this moment of revelation, the so-called epiphany, and I loved in particular the story of Eveline, who wants nothing more on this earth than to be able to leave her oppressed life as daughter and housekeeper for her violent father and as a mother for her brothers, but who, given the chance to leave, stays. And this was my reaction: I felt I knew who Eveline was, why she clung to the iron railing. Even though her life was so different from mine in every way, I knew that feeling. And that feeling was what I wanted to write about in Knots, to try to see it from as many angles I could, and in as many different life-tanglements as possible, be it a man tied to his mother by an umbilical cord for the rest of his life, a woman not able to erase her desire for a man who doesn’t love her, a young girl who tries to hide from the rest of her family so she won’t have to play the piano for her grandfather who’s visiting, or aliens struggling with their personal relationships. Joyce’s stories’ impact on my own stories were at the same time contrasted by a radically different influence: that of Kafka’s shortest short stories. Kafka’s shortest short stories provided the confidence that anything is possible, in terms of form, in terms of theme. For instance “The Trees,” which consists of only four sentences, comparing us to trunks in snow, how it looks as if the trunks could be tipped over by just pushing them lightly, “but no, you can’t.” Because the trunks are connected to the ground, beneath the snow. And Daniil Kharms proved how free and subversive a piece of short prose can be, he discards narrative structure, he discards symbolic meaning, he discards just about anything, for instance in the text Blue notebook no. 10 which begins: “Once, there was a red-haired man who had neither eyes nor ears. He had no hair either so he was called ‘red-haired’ only theoretically.” As it turns out, this man hasn’t got anything at all, so the text concludes: “In fact, we would rather not talk about him any more.”—there is, literally, nothing to say. He doesn’t exist. To me this is true. The truth about writing short stories to me is that is gives you freedom. I don’t have to think about the novel’s need for some kind of plot, or development, I can concentrate on the situation, the moment, the thought, the feeling, or even the nature of language, or on the nature of narration itself. The narrator can swoop in, and swoop out again, and even make the heavy, iron-like lumps of human experience float like a feather in just an instant. And that’s why I think we need short stories so desperately.